Um. I have this overwhelming addiction right now: DIY Bracelets. I want a stack of them a mile wide going up my arm (the one that ISN’T covered in Shingles, thank you very much). And, for the moms out there, most of these bracelets could easily be shortened down to pint-size kiddo versions – and they’d be done faster too. Still, I think my bracelet fascination comes from the satisfaction of taking a little time to make something stylish just for me. This summer I’m trying hard to spend less moola, so this is another way to fuel my need for something new, without breaking into my bank account! I’ve already made the first three bracelets on the list – but maybe one day I’ll have tried them all. 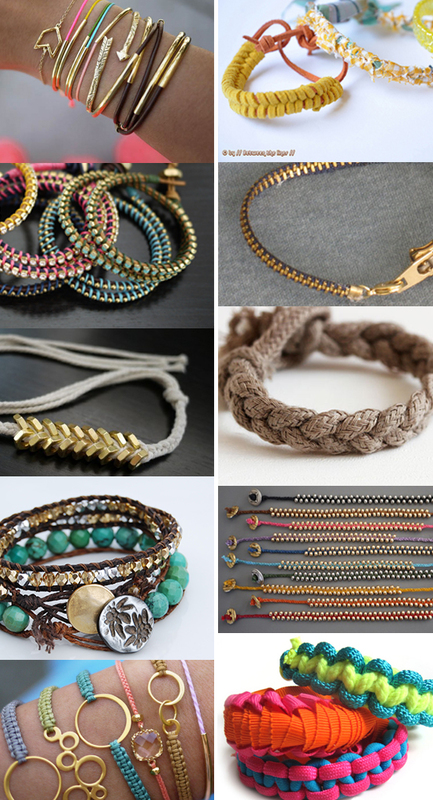 You can see all of my favorite DIY bracelets on my Pinterest board – did I forget any? Please share your favorites in the comments! For new design finds every day of the week, please sign up for Small for Big’s email newsletter! Worth 1000 Words: Lots of inspirational design finds, art, and playful goods. Round Abouts: Every week I gather my favorite design finds and inspirational picks from around the web – SO MANY GOODIES. DIY: Find lots of printables for you and the kids in your life, plus great DIY links like this bracelets post. Gift Guides: These are chock-a-block full of great ideas for kids gifts and toys year – round, with over 200 recommendations arranged by age and price just for your viewing pleasure. See the latest gift guides, and oldie-but-goodie gift guides too. Or, go straight to my shop to purchase them! Oh – and I’d love to chat with you more – Follow Small for Big on Twitter, and Like our Facebook page! Thanks so much for stopping by – enjoy! Hi Mari. Thanks for featuring my tutorial in your fun post! I’m also having a sample sale in my boutique with a variety of different bracelets if you don’t have time to make them. Sale through July 6th. Thanks Tracy – that’s great news! Where can I get one?! Courtney, these are all how-to tutorials so you can make your own! Or, look at Tracy’s comment just above yours, it has a link to her bracelets for sale that are also featured in this post. These look just like the designer ones for $80 and much more! Great! You’re right, and they’re all pretty easy and fast to make! I make them! please check out my ArmCandy! These are great picks! The link to the braided bracelet tutorial isn’t working. How can I find you on pinterest? these are great. they look wonderful. we do some with diamonds. The braided bead bracelet is also from Honestly WTF. Apparently it was taken without due credit by Saifou. The pink 1 seems to be annother bracelet then the rest ( the square bracelets ), how do i make that one? In the bottom right hand photo? I believe it’s the same technique as the other two, but it uses flat ribbons instead of round cord. So it just looks different. Have fun! Here are my top 30 pics of DIY bracelets – with the tutorials linked through where available! I love all of these DIYs but I’m always struggling to find the supplies and at my local craft stores especially for reasonable prices when bracelets require a few different materials that are each individually priced quite high. Where do you buy your supplies? Can you recommend a few online stores that may sell a lot of these supplies for cheap and in reasonable quantities? Ps. I am always looking for brass hex nuts and waxed cotton linen (in colors other than black & brown)! Where do you find them? It’s so frustrating in the stores, they don’t always carry quality products. I have the best luck on Etsy – search the supplies section. You can find the brass nuts too! Where do you buy your supplies? Can you recommend a few online stores that may sell a lot of these supplies for cheap and in reasonable quantities? Hi Cyless, I don’t have a specific shop, but I have the best luck searching the supplies section at Etsy.com. Have fun! and said “Look how cloudy it is here. There are many coaching videos, courses (often run by your local Soccer Club), books and other coaches to help you. site is excellent, let alone the content! Next post: happy fourth of july! Copyright © 2012 Small for Big. All rights reserved.